The shorelines of Boston and Cambridge will be crowded with spectators this weekend for the world’s largest regatta. 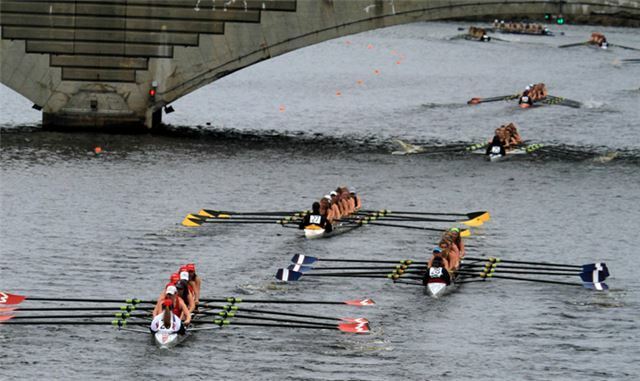 The 52nd annual Head of the Charles River will bring more than 2,000 boats representing clubs and colleges from 28 different countries to compete on the renowned 4,800-meter upstream race. More than 50 athletes who competed at the Olympics in Rio will hop in a shell in hopes of winning Boston—including the gold medalist US Women’s Eight! While anywhere along the Charles River shoreline from the start at the Boston University Boathouse to the finish at Herter Park offers great views, the best places to watch are from the six bridges over the course. The John W. Weeks Bridge near Harvard is particularly notable, as it is over the infamous turn in the river where skill comes into play—and where many boats collide and crash. While the rowers will exert strength with each stroke, spectators can nosh on food truck delicacies and buy HOCR swag from the merchandise tents along the Boston and Cambridge shorelines. This quintessential autumn event in Boston is the perfect blend of the city’s athletic prowess and penchant for prep—cheering and plaid are both highly encouraged. Tips: Parking is limited and traffic will be brutal. Public transportation is highly encouraged.